In January 2018 MoaAlm Mountain Retreat was featured by The Guardian newspaper as one of the best retreats in the world for mind, body, and spirit breaks. MoaAlm Mountain Retreat provides an extraordinary winter holiday. They love exploring the snowy mountains by foot! Depending on weather and snow conditions, they will take you out on guided snow shoe tours or winter hikes. Because the number of guests is limited, they can adjust duration and level of difficulty to the group's preferences. Of course, they also offer daily yoga sessions in their in-house yoga studio, with stunning mountain view, as a perfect start to the day. The MoaAlm Mountain Retreat has comfortable single, double, twin, or triple rooms. The rooms are stylishly decorated and spacious, with sizes that can go up to 24 square meters. All rooms have an en-suite private bathroom and stunning views. Some have balconies, but not all. All rooms can be made up with one double or two single beds. After an active day in the outdoors, you can enjoy the astonishing view from the sunny terrace or relax in the living room to enjoy a drink at the bar, curl up on the sofa with a magazine or book, or enjoy a meal at the shared dining table. The resort offers an in-house yoga studio, which has a panoramic mountain view and is the perfect place for an active start to the day. There, you will have the opportunity to practice energizing yoga in the mornings or a relaxing session of restorative yoga in the afternoon. In the morning the sunrise fills the room with energy and the late afternoon turns the mountains pink. There is no set daily schedule. MoaAlm Mountain Retreat understands that every guest and every day is different. The benefit of small groups is that they can adapt, discuss, and personalize each day. A typical day may start by enjoying a morning Vinyasa yoga session in the in-house yoga studio with a view on the sunrise over the mountains followed by eating breakfast together at the shared dining table. Snow shoeing up to the Lesach Riegel Hut and having a little picnic with a view at the Grossglockner (Austria's highest mountain) follows. After this, you may warm up at MoaAlm with a cup of tea on the sofa in the living room, maybe read one of their books or magazines, or play a board game. Share stories and wine while you are at it, accompanied by a delicious three course dinner and discussion to plan the next day's adventures. Depending on snow conditions, guided snow shoe hikes and cross-country skiing excursions are included in this retreat. Chesca is our resident yoga instructor from England, and has spent the past 2 years teaching in India and London. Before joining the MoaAlm family she taught at the Sivanada Yoga Ashram in the Bahamas as a resident karma yogi. She believes there is no such thing as being 'good' at yoga and can be practiced by everybody. With an element of fun and a focus of being present and in touch with the Self - she encourages her students to take the balance of energy and relaxation found on the mat back out into daily life. This holiday will take place 1800 meters above sea level in Kals am Grossglockner, Austria; in the middle of Hohe Tauern National Park. At MoaAlm they love food! There is no better start to the day than a nutritious breakfast. MoaAlm serves fresh fruits, oats and cereals, bread, eggs, and much more. After an active day in the outdoors, you can warm up with a cup of tea and enjoy freshly baked cake. At dinner, the chef always surprises with a delicious three course vegetarian meal made with lots of love and attention. MoaAlm believes that food tastes best when it grows close-by: their ingredients are local, fresh, and organic whenever possible. Drive through the village past the church and the small supermarket. At the first Y-fork, keep right, following the green signs for MoaAlm. At the second fork, keep left at the beautiful wooden house with the blue and white balconies. From the final fork, it is a 10-minute drive to MoaAlm. During the winter, you will leave your vehicle in the small parking area just past the final fork. Please book your flight to arrive either at Innsbruck International Airport (INN), Munich International Airport (MUC), Klagenfurt Airport (KLU), or Salzburg Airport (SZG). To get to MoaAlm in Kals, it is recommended that you rent a car. Car rental starts at 140 EUR per week. You can travel by bus or train from Innsbruck, Munich, Klagenfurt, and Salzburg to Lienz or Huben in Osttirol. MoaAlm Mountain Retreat will pick you up in Lienz or Huben in Osttirol free of charge. This is often the cheapest but most time-consuming option. Public transportation in Austria is very reliable and the platforms and directions are clearly indicated. You can find airport shuttle taxi service from Innsbruck International Airport (INN), Munich International Airport (MUC), or Salzburg Airport (SZG). In winter, the tourist office provides a shuttle service costing from 60 EUR per person one-way on Saturdays. You can contact MoaAlm Mountain Retreat to book this transfer. Der Restbetrag ist 70 Tage vor der Ankunft zu zahlen. 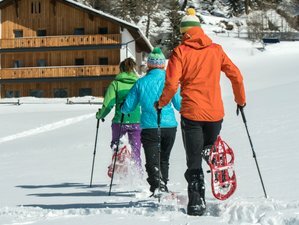 MoaAlm Mountain Retreat ist ein kleines Unternehmen, dass erholende Aktivurlaube anbietet und tägliche Yoga Kurse mit geführten Sommer und Winter Aktivitäten und köstlichem Essen kombiniert.